When you gain this, gain two coppers. 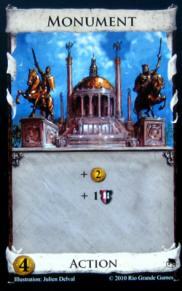 When you play this, count your deck and discard pile. Worth 1 treasure per 5 cards total between them (rounded down). 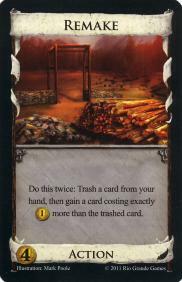 Do this twice: Trash a card from your hand, then gain a card costing exactly 1 treasure more than the trashed card. Trash this and another copy of Treasure Map from your hand. 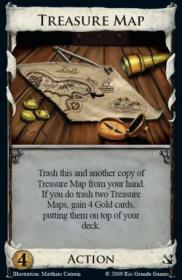 If you do trash two Treasure Maps, gain 4 gold cards, putting them on top of your deck. Name a card. 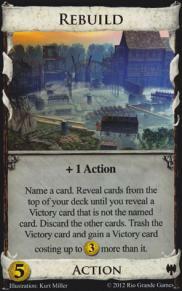 Reveal cards from the top of your deck until you reveal a Victory card that is not the named card. Discard the other cards. Trash the Victory card and gain a Victory card costing up to 3 Treasure more than it. 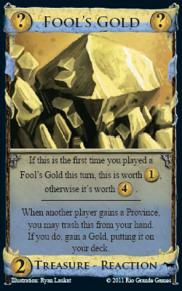 If this is the first time you played a Fool's Gold this turn, this is worth 1 Treasure, otherwise it's worth 4 Treasure. When another player gains a Province, you may trash this from your hand. 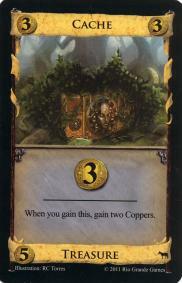 If you do, gain a Gold, putting it on your deck. Each other player reveals the top 2 cards of his deck. If they revealed any Treasure cards, they trash one of them that your choose. You may gain any or all of these trashed cards. They discard the other revealed cards. Each other player gains a Ruins. 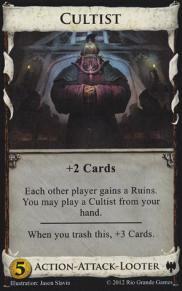 You may play a Cultist from your hand. When you trash this, +3 Cards. 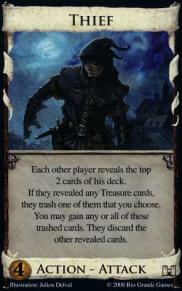 Each other player reveals cards from the top of his deck until revealing one costing 3 Treasure or more. 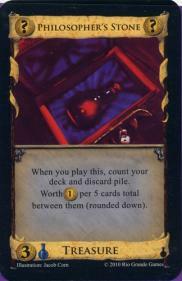 He trashes that card and may gain a card costing at most 2 Treasure less than it. 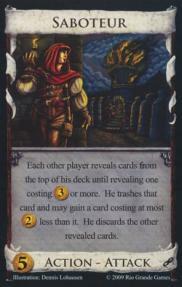 He discards the other revealed cards.